Believe it or not—you’re now officially in your 9th month of pregnancy. Your baby at this time is as big as a papaya or romaine lettuce, and could be making plans to arrive any time now. This is probably a great time for you to do any leftover preparation work such as speaking with your health insurance provider and adding the final touché to your nursery. Week 36 is also a great a time to maybe go on a date with your partner without the dancing shoes of course. Most of the symptoms you experience when you’re 36 week pregnant are related to your baby’s close, upcoming arrival. So without further ado, let’s take a look at these symptoms. You will most likely feel discomfort in the pelvic area due to your baby moving down and applying pressure. However, keep an eye out for signs of labor such as regular, constant contractions. Your lungs will have a bit more space to breathe given your baby has moved down towards your pelvis. You’re probably used to not getting the best sleep by now, considering this symptom kicked in the first few weeks of the second trimester. Best solution for this is to try and find a great sleeping position, and try and relax. This is a common symptom especially in week 36 of your pregnancy, and is caused mostly due to the act that your baby is crowding up your digestive system. The amount of discharge may rise considering that your body is preparing itself for birth. But look out for watery discharge aka amniotic fluid, because leaking this is a sign of preterm labor. This is the tightening in your abdomen that you were experiencing in your previous weeks of pregnancy. These are not to be confused for regular contractions, but call your OB if they get too severe. Owing to the act that the symptoms of 36 weeks pregnancy may be tough to tell apart from traditional pregnancy symptoms, you will want to keep your doctor informed on anything that is out of the ordinary. One thing that isn’t going to change starting week 36 is the size of your belly. By this time in your pregnancy, you should’ve gained roughly between 25 and 35 pounds in total. The aforementioned numbers are the recommended weight gain for women with average BMI. You’re probably finding it hard to move around given your belly has almost reached its peak size, but on a brighter note, you will probably only gain about a half a pound per week moving forward. You most likely have gained much more weight if you’re pregnant with twins, somewhere between 35 and 45lbs. Some moms pregnant with twins deliver their babies around week 36, so brace yourself as this may be your lucky week. 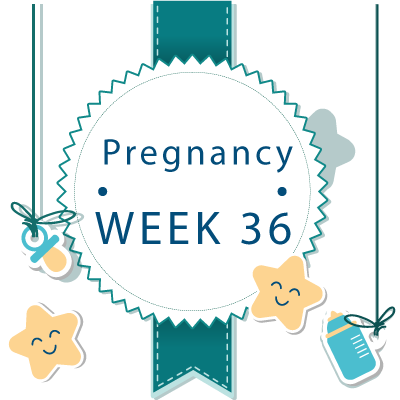 36th Week Pregnant Ultrasound - What to Expect ? 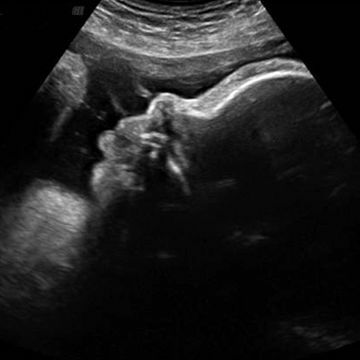 At 36 weeks, most if not all your baby’s organs are in excellent working order including kidneys and lungs. But there’s no need to worry as they generally will attain the right position automatically. If you do have a breech baby, your doctor will may attempt to get your baby in the head down position by pushing or lifting your pregnant belly. Although this may sound rough, it is truly a simple, small procedure that works more than 50 percent of the time A 36 week ultrasound will be performed so that your OB can clearly see the position your baby is in and the location of your placenta. This ultrasound may also be used as a guide for your doctor’s judgment. When you’re 36 weeks pregnant, you will probably have a Group B Strep test which as you might have guessed will detect if you have this bacteria present in your body. You may have this bacterium without even knowing it, and even though it may not cause any problems for you, it may be life threatening to your baby Treating these bacteria is simple with an antibiotic drip during pregnancy. 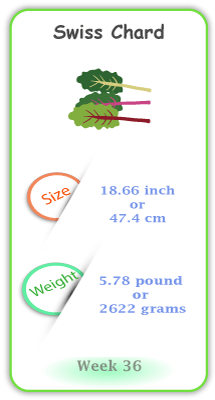 At 36 weeks, your baby measures roughly 18.66 inches and weighs 5.78lbs. As mentioned earlier, all its organs are functioning well such as its circulation and immune systems. Further, your baby may be even getting ready to breathe on his/her own, and their movements may become less frequent as they have less room to play with.